Spine surgery is a rapidly evolving field as more traditional large open spine surgeries continue to give way to minimally invasive spine (MIS) surgical techniques. These minimally invasive approaches can be equally effective while being much less disruptive to the spine’s supporting tissues. 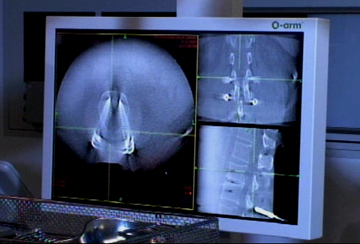 The safe and effective practice of these techniques requires extensive training and knowledge of the spine and relies heavily on technological advancements. 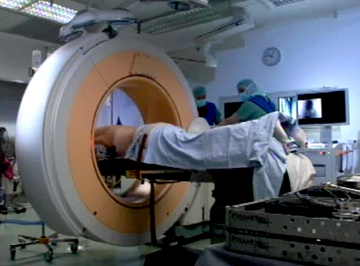 Of particular importance to MIS techniques is the equipment used for intra-operative visualization and structural localization. MIS surgery is typically performed through small portals that pass through muscle without destroying it. The ability to work through these portals involves the use of microscopes and endoscopes to visualize the spinal structures and these scopes continue to improve with hi-definition and 3-D technologies. Visualization of the intricate anatomy of the spinal bones and nerves is crucial to the safe and effective performance of spine surgery. With high power magnification and clear visualization, the ability to perform MIS techniques has been greatly enhanced. One of the more exciting technological advancements in spine surgery is the use of intra-operative fluoroscopic imaging resembling a CT scan linked to computer navigation which allows real-time visualization of the spinal structures. At the Center for Spine Care, we utilize the O-Arm Stealth Navigation System® in our MIS surgeries to see the 3-D structure of the spine in the operating room on a computer screen with amazing accuracy. This technology allows us to perform major spine surgery through minimal incision with un-paralleled safety and accuracy. This translates to lower risk and complication rates and greatly increases the accuracy of the procedure. In all aspects of life, we see technology rapidly evolving on a daily basis. These technological advancements translate readily to the surgical equipment we use in the operating room. When applied appropriately, and by experienced users, these advancements continually enhance the safety and accuracy of minimally invasive surgery which leads to improved and safer patient outcomes. Michael J. Musacchio, Jr., M.D., FAANS is a Center for Spine Care minimally invasive neurosurgeon specializing in the spine.